The SuperFlower has been the unadvertised secret product for years and has now made its way into its own featured cabinet. 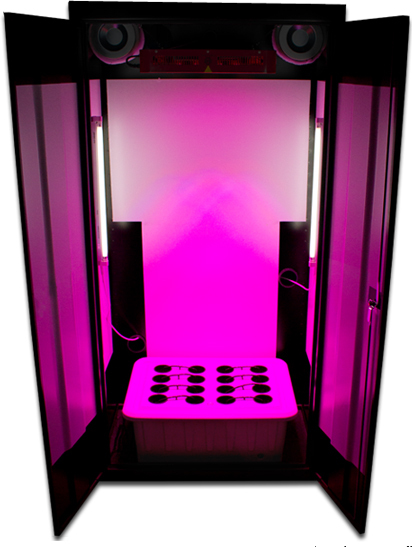 We think the design and specs of this newly featured system will be hugely popular with beginning and experienced growers alike. The New SuperFlower is the all important left side of the Trinity 2.0 and is now upgraded with SuperPonics to grow your plants up to 2-5X Faster, Bigger, Better, and Easier than other traditional methods along with all the other Award Winning Features, Customer Service, and 3 Year Warranty. All of our Award Winning Features are included with the SuperFlower - Lifetime Customer Service and an industry leading 3 Year No Hassle Warranty. Easy as One, Two, Three, Grow! Comes with EVERYTHING You Need, Including the TechnaFlora Nutrients Starter Kit. Anti-Mold Reflective Panels For Optimal Light Distribution and Cleanness. Free DVD and Lifetime Customer Service. The SuperFlower is a single chamber, Full-Cycle cabinet, meaning you can grow from seed to harvest. Arriving at your door completely assembled, including everything you need to get started (plug it in and add water and provided nutrients starter kit! ), and with a maximum growth height of 4.5ft, the SuperFlower is perfect for all your growing needs. Dimensions: 36" x 24" x 72"
Harvest 1-16 5 Foot Tall Plants Every Single Month! Utilizing our patented SuperPonics watering system, this reservoir can hold up to 15 gallons of nutrient based water and is incredibly easy to maintain. The LED's are encased in a well ventilated, fully enclosed metal frame and is height adjustable! This allows your plants to get the perfect amount of light at all stages of growth!!! Automated SuperPonics System. You can also grow in Soil. CO2 is an extra $199.95 and recommended to achieve up to 30% more yield. Only SuperCloset Grow Systems are professionally assembled with every component imaginable including air-filter, nutrients, timers, and growing medium. Only SuperCloset Cabinets are guaranteed to grow easier, bigger, healthier and better than any other grow cabinet or system. Up to 20% less energy usage, power surges, more efficiency than other systems with our special digital ballasts. Yield up to 40% more growth with exclusive Net Trellis and unique auto watering method. Tips in DVD video. Fully automated controls with hydrometer on back of unit, not front, to retain clean cabinet appearance. “No corner plants left ungrown” Only cabinet design with real-cross airflow, PROPER air-cooled lights and internal circulation fan. Free No Hassle 3 year Warranty. We incorporate the very best components, design, and customer support. Fantastic watering system. No clogged drippers, constant cleaning, or random dead plants. Strongest roots and plant structure possible. Leave for days without worry. See testimonials! Only one plug in to any outlet in your home or apartment on a standard 110v!!! Yields up to 30-50% more than other systems. 3x more airflow than most other systems. Comes with every single component imaginable and free technical support. Heavy Duty aluminum circuit boards @ 2cm thick for optimal heat dissipation. Helps your Super LED run smoother and more efficiently for years to come. Game-Changing Secondary Optical Lens for maximum photosynthetic pentration for plant canopy to the stem. Will match or outperform ANY other 3 watt LED grow light, including the very expensive HydroGrow LED lights, Guaranteed! Produces more yields per watt than HPS lights with better internodal spacing for denser fruits and flowers. Produces less heat than HPS lights, eliminating the need for fans that can be noisy. Grounded Power cord plugs into any standard 120v household outlet - Measures 7' long. Constructed under stringent quality control standards - You can expect years of trouble-free use. Your fully automated Superponics system will grow faster than any single method of hydroponics. You also grow safer as there are both an air pump and a water pump powering your plants, so that if either go out, your plants will still live! Growing your plants by both top feed watering and bottom feed oxygenation will ensure that your plants thrive and grow at rates you truly never thought possible. They can grow plants up to 2-5x times faster than any single hydroponics method, and up to 5 times faster than growing with soil. The perfectly designed carbon filter made by OdorSok eliminates 100% of the odor produced inside of your grow box. You can expect about two years of use before needing to replace the activated carbon - Which is very easy to do. This carbon filter helps to make sure that the air coming out of your cabinet is clean and odorless! Each SuperFlower comes with a Nutrient Starter Kit. Lotus is a simple 3 part nutrient line that replaces the need for complex 8-10 part recipes. This 3 part system gives your plants everything they need for development from seed to harvest, giving you unmatched results in flowering and fruiting plants. 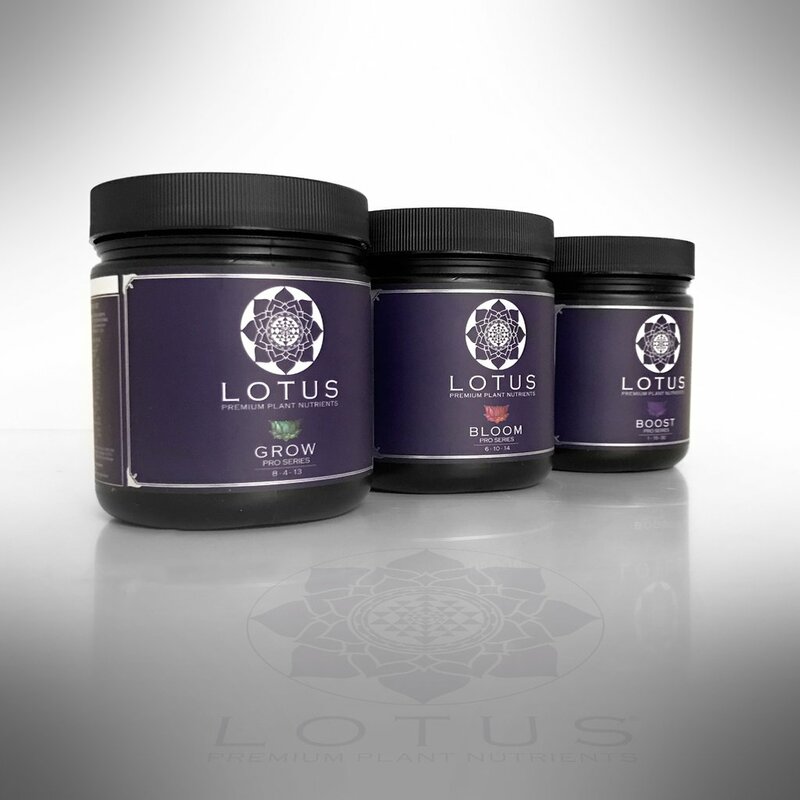 Specifically formulated for medicinal plants, Lotus Nutrients are 100% water soluble formula milled and blended to provide perfect consistency and contains no binders, fillers, or dyes. 16 oz. Lotus Pro Series Grow: Specially formulated to give your plants exactly what they need to produce lush, rapid vegetative growth. Lotus Pro Series Grow will aid in producing thick stems, tight inter-nodal spacing, dense canopy development and massive root systems, all of which are the building blocks for successful harvests. The turbo-charged secret weapon that leads to an unsurpassed size and density of flowers, while maximizing oil production for increased potency and taste. Specifically designed to trigger the rapid onset of flowering, by providing your plants with all the necessary components needed for strong development, producing dense, massive yields spanning all flowering sites. This kit also includes a full feeding schedule that will explain how to mix your nutrients, when to use them, and how often to feed your plants. You will be impressed by how well your plants respond to these awesome nutrients. You'll impress your friends with your bountiful crop each and every time! Are your plants looking funny? Check your pH! Regularly checking your pH is one of the most important parts of running a hydroponic system. Each SuperFlower comes with a pH Control Kit from General Hydroponics. The kit comes with 8 ounces of pH Up, 8 ounces of pH down, pH indicator solution, test vial, a dropper, and a color coded identification chart. 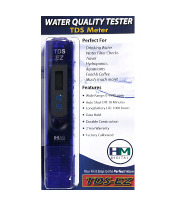 The TDS-EZ Meter has a large and easy-to-read LCD screen. It has a transluscent blue housing made of strong and durable plastic. On the back of the meter you will find a color coded chart that explains the TDS values so you know exactly how to read your meter. 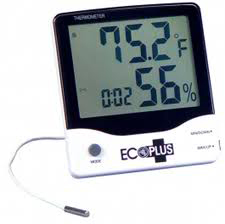 This meter is perfect for testing the amount of nutrients in your hydroponic system. This fan is perfect for the interior of the SuperFlower. It is a 2 speed, 4 1/2 inch internal circulation fan which produces 100 or 160 CFM (Cubic Feet per Minute) of air flow depending on the setting. The purpose of the fan is to create a breeze that moves your plants - This recreates natural wind, which is crucial because it helps to strengthen the stems of the plant so that they can handle the weight of the massive fruit and vegetables they will produce! 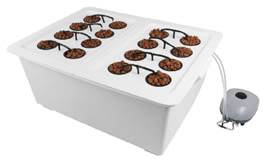 The fan is fully adjustable - Change the height, speed, and tilt of the fan so that your plants grow nice and strong. This timer is one of the most crucial parts your SuperFlower. It is responsible for regulating the on / off cycle of the lights, exhaust fan, and internal circulation fan. Programming the timer is super easy - Once you have it setup you can safely leave your grow box for days at a time without worrying. Wondering what the temperature and humidity is inside of your SuperFlower? Our Digital Thermometer and Hygrometer takes the guesswork out of managing your SuperFlower by providing you with accurate temperature and humidity readings on the fly. This unit comes complete with a clock function, alarm, 12 / 24 hour mode, and a waterproof temperature probe. 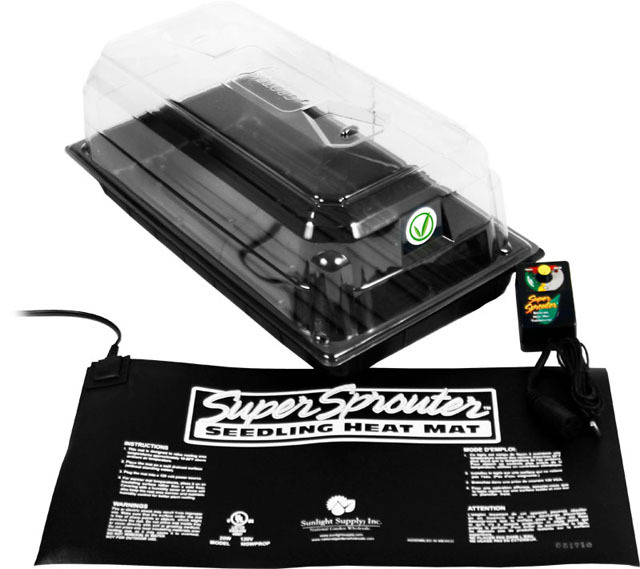 Rockwool is the perfect medium for starting plants with the Superponic System and the Supermini Cloner. It is made from rocks that are melted and spun together. Rockwool provides a stable foundation for your roots to start growing. Once your plants are mature enough, simply transfer the Rockwool Cube to the clay rocks in the Superponic system and watch your plants take off! Our top-quality Dutch Master Replicator Cloning Gel is included with each SuperFlower. This professional strength and ready to use cloning gel makes quick work of cloning your plants. It is as simple as taking a cutting at a 45 degree angle, trim down the leaves a bit, then dip the cut end into the cloning gel for about 30 seconds. Insert into the Rockwool Cubes and place them into your SuperMini Cloner. The 100% natural root stimulant will help your clone to quickly take root. The primary pump for the SuperPonics system is our high quality 185 GPH (gallon per hour) water pump. This pump acts as the heart of the system - constantly circulating fresh water to your plants so they stay healthy 24/7. The pump is driven by a powerful and oil free magnetic rotor. The high quality bearings and ceramic shaft insure reliability and quiet operation. Plug it into your programmed timer and you will never have to worry about whether or not your plants are getting watered. This pump is covered by our 3 Year No Hassle Warranty, so you have complete peace of mind. The Eco Air 2 Air Pump is perfect for the included SuperPonics system. It helps keep the nutrient solution aerated with fresh oxygen, which your plants need in order to flourish. This model features variable output so you can adjust how much air your plants receive (the more the better!) This pump is powerful, durable, and quiet! Plus, it is covered by our 3 Year No Hassle Warranty. Safety First! We always encourage following proper safety protocols, especially when water and electricity are in such close proximity. We include this high quality Shock Buster GFCI plug adapter with every grow box. It is easy to use and a must for preventing electronic malfunctions. The purpose of this switch is to shut off the electrical supply to your grow box if a surge in power is detected - Which can occur if water comes in contact with live electrical equipment. Too many nutrients can damage or even kill your plants! We include a measing cup with every grow box so you know exactly how many nutrients you're feeding your girls. All plants growing in a hydroponic system need a solid base to flourish - Clay Grow Rocks provide a perfect base for your plants to grow on. The clay grow rocks provide perfect drainage and a solid foundation for the roots of your plant to cling to as your plant grows larger. CO2 is simply amazing - One simple component can increase your growth rate by up to 50%!! This CO2 kit comes complete with a Solenoid, Regulator, Timer, and Injection Tubing. Professional growers know the true value of a quality CO2 system, that's why you would have a hard time finding a serious grower that doesn't use a CO2 system. It is super easy to setup inside the SuperFlower. The included instructional DVD will guide you through setting up your CO2 system. Estimated setup time is only 5 minutes! Note: CO2 tank not included. Is your city / municipal water full of chloramines? Do you have well-water full of iron and sulfur? If so, a Reverse Osmosis Water Filter will solve all of your water woes. Save the hastle of buying water from the grocery store! Our Reverse Osmosis Water Filter can provide up to 200 GPD (gallons per day) of highly purified, ultra low PPM water. It will remove 99%+ of chloring and other contaminants. Due to its high quality, ultra high efficiency design, it wastes 25% less water than other RO systems. This package includes EVERYTHING that you need in order to maximize your chances of having all of your precious babies blossom into adolescence. You will be able to quickly, easily, and significantly increase your germination success percentages with this all-inclusive kit. 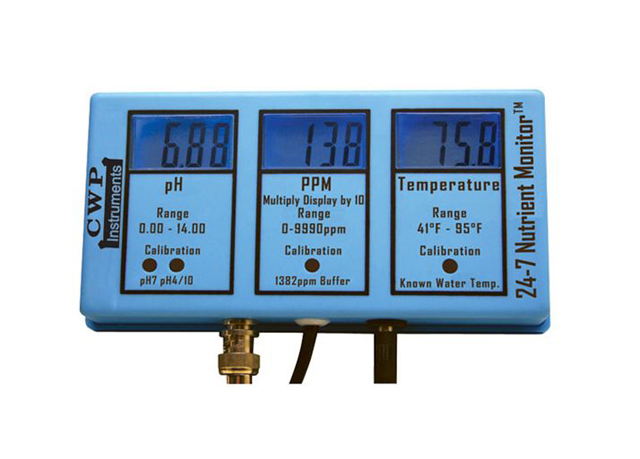 Our 24-7 Nutrient Meter made by Control Wizard Products is perfect for growers that need to constantly monitor the water in their hydroponic system. This meter measues pH, PPM, and Temperature. Measurements are displayed on a large illuminated display that is easy to read from a distance. This unit is also very easy to calibrate - Calibration screws are conveniently located on the front of the unit. 64 oz. Lotus Pro Series Grow: Specially formulated to give your plants exactly what they need to produce lush, rapid vegetative growth. Lotus Pro Series Grow will aid in producing thick stems, tight inter-nodal spacing, dense canopy development and massive root systems, all of which are the building blocks for successful harvests. 36 oz. Lotus Pro Series Boost: The turbo-charged secret weapon that leads to an unsurpassed size and density of flowers, while maximizing oil production for increased potency and taste. 64 oz. Lotus Pro Series Bloom: Specifically designed to trigger the rapid onset of flowering, by providing your plants with all the necessary components needed for strong development, producing dense, massive yields spanning all flowering sites. The ultimate optical tool for indoor gardeners. 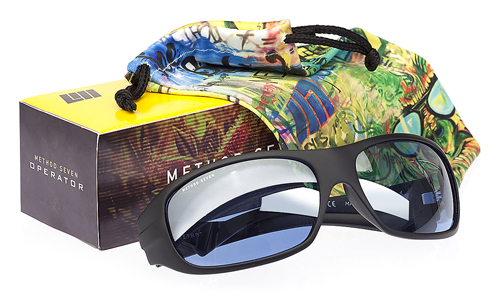 Featuring patent pending Rendition Technology, your Method 7 Growing Glasses provide the "Perfect Color" when viewing plants under bright grow lights. This technology was created for growers who need to work with their plants while their grow lights are on. Your eyes stay protected and you see a full range of natural colors. Staff review of the SuperFlower is coming soon! All of our grow boxes are built to order and shipped from our state-of-the-art facility in San Francisco, CA. You may pick up a grow box locally if you are near our shipping facility. There is no charge for picking up your grow box from the manufacturing facility and you will not have to pay for shipping. Contact us for more information. Orders shipped to Florida will be charged sales tax. Orders picked up from the manufacturing facility do not have to pay sales tax. Processing / Manufacturing Time: 15-25 Business Days - All units built to order. Shipping Method: Freight - Grow boxes are shipped through a freight company. They are too large and heavy to ship via UPS or Fedex. Packaging Materials: Grow Boxes are palletized and discretely packaged. There are no labels or stickers on the packing to indicate its contents. Shipping Destinations: We only ship to the Continental United States & Canada. Please contact us for shipping quotes to other destinations such as Alaska and Hawaii. This product includes a Three (3) Year Warranty on all internal components except for the light bulbs. Lifetime Customer Service is included at no extra charge. We have an experienced horticulturist and hydroponic enthusiasts on staff to assist growers of all skill levels for as long as they own their grow box.